Developer Spin Bottle Games and publisher Chillingo finally re-released the award winning Zooloretto [App Store] to the iPhone last night. The original 1.0 release of the game was quickly pulled due to the presence of a major bug affecting gameplay. The game has since been updated and re-released as a 1.1 version that addresses the issue. Amongst other awards, the original board game won Australian game of the year in 2007. Zooloretto. places the player in a colorful, cartoony zoo setting and challenges them to use small, large, wild, and exotic animals and their young to try and attact as many visitors as possible to the zoo. 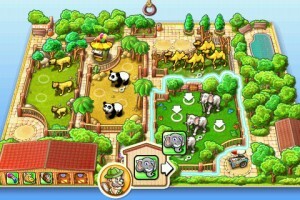 The game involves strategy and planning, as there’s only room for so many animals in the zoo. One forum participant provides an overview of the gameplay and scoring.